Indianapolis Motor Speedway is one of the most historic tracks in America and as such, it’s seen a lot of major repaves over the years. 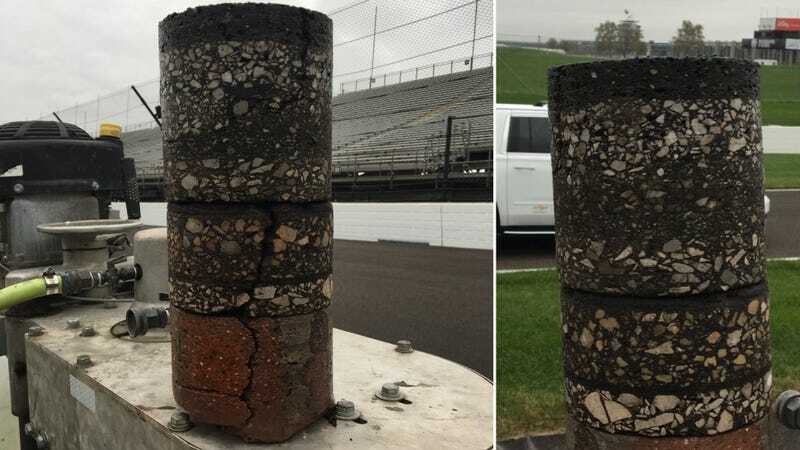 It was once paved in all bricks, but taking a core sample of the track surface shows off all the years of work that’s been done to the track, layer by fascinating layer. That’s right: one of the world’s most famous tracks began its life as creek gravel and limestone back in 1909, even before the bricks were laid. Asphalt took over most of the surface in 1961, save for a yard-wide strip of brick at the start/finish line. What’s the craziest to me, however, is the height. We resurface roads and things all the time, not noticing exactly how much they get built up every time they get redone. That core sample is a couple feet tall of just road surface, which shows exactly how much taller IMS has gotten over the past century. That’s nuts!